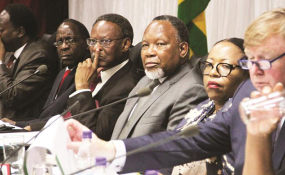 Cape Town — The Kgalema Motlanthe Commission has concluded its process of gathering oral evidence through public hearings - a move that has sparked an angry backlash from the opposition ranks. "The Commission of Inquiry into the Post Election Violence which occurred in Harare on August 1 this year, today concluded its process of gathering oral evidence through public hearings. Testimonies, most of which were broadcast live on ZBC television and Social Media platforms were heard from different individuals and organisations in Harare, Bulawayo, Gweru and Mutare," their press statement read. The commission's spokesperson says they are now collating and analysing all information gathered and have already started compiling their final report and recommendations to be presented to President Emmerson Mnangagwa. Several witnesses, including relatives of the deceased, army and police commanders and leaders of the opposition have given their testimonies, with some of the relatives demanding the government compensate the victims' families. In a long and impassioned defence, senior opposition politician Tendai Biti, who's a vocal critic of Mnangagwa's government, appeared before the commission of inquiry to defend himself against the allegations of inciting public violence that led to an army crackdown. Biti accused some witnesses of encouraging MDC supporters to protest when results weren't released fast enough for the July poll. Zimbabwe's opposition leader Nelson Chamisa also distanced his party from post-election protests. Testifying earlier during an inquiry hearing, Chamisa said his party was not a perpetrator but rather a victim of state-sponsored violence. The Motlanthe led Commission of Inquiry has also come under fire for not inviting Mnangagwa and Vice President Constantino Chiwenga to give evidence before them. Former advisor to the late prime minister Morgan Tsvangirai, Alex Magaisa said, "Commission Of Inquiry says it has completed oral hearings. May the record reflect that it did so without hearing oral evidence from two of named and critical actors: Mnangagwa and Chiwenga, who were President and Defence Minister at all materials times of the subject of investigation." Former minister of education, sport, arts and culture, Senator David Coltart took to Twitter to voice his frustrations. "The Mothlanthe Commission Of Inquiry has concluded its hearings without asking the most important question of the most important actor in this drama - they haven't asked President Mnangagwa whether he authorised the deployment of soldiers in terms of sec 213 of the Constitution," he tweeted. Human rights lawyer and opposition activist Doug Coltart has accused the Commission of not giving other victims the opportunity to testify. "I am deeply concerned that the Commission of Inquiry has closed its public hearings without hearing the testimony of 15 victims whose affidavits were "lost" and were never given an opportunity to be heard. The Commission must hear their testimonies" he said. One of the victims according to a New Zimbabwe report, is a retired top Zimbabwean army official Lieutenant Colonel Elliot Piki who was reportedly abducted by unknown assailants, forcing his wife Sibongile Sarukato to approach the Zimbabwe Lawyers for Human Rights (ZLHR) to petition the High Court to force the government to investigate his whereabouts. In a statement ZLHR said the wife reported that Piki disappeared on Sunday, November 25, 2018, at around 16:30 at his Waterfalls home. Mnangagwa appointed Motlanthe to lead a seven-member team to investigate the killing of six people following military intervention in the country's capital, two days after the July election. The commission has three months to complete its investigations and report back to the president.